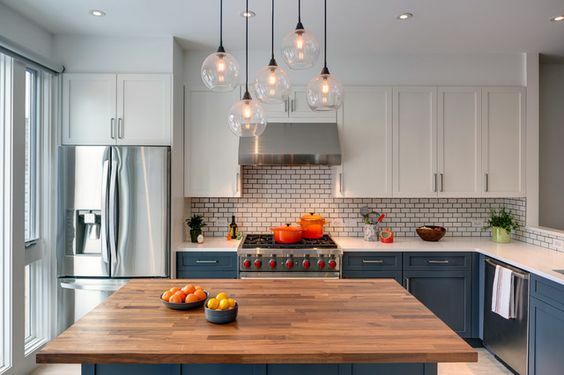 There are so many different types and sizes of kitchens that it can be difficult to find exactly what you’re looking for. If you have an L shaped kitchen layout you want to know how to adjust your cabinets and everything else you have to get a great outlook. After all, the right layout and the right adjustments can create a flow to get through your kitchen. So what does it mean to have an L shaped kitchen layout? It means that when you look at your cabinets they form a right angle. So you have two straight lines of cabinets and appliances that come together to form that right angle. 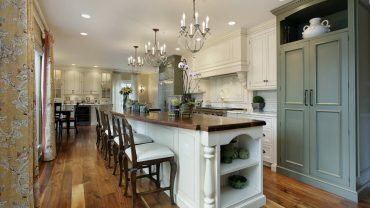 These types of kitchens may also have an island or bar that extends through the middle or on the side to give you even more cabinets. They generally have one side of cabinets that extends further than the other but this isn’t required. 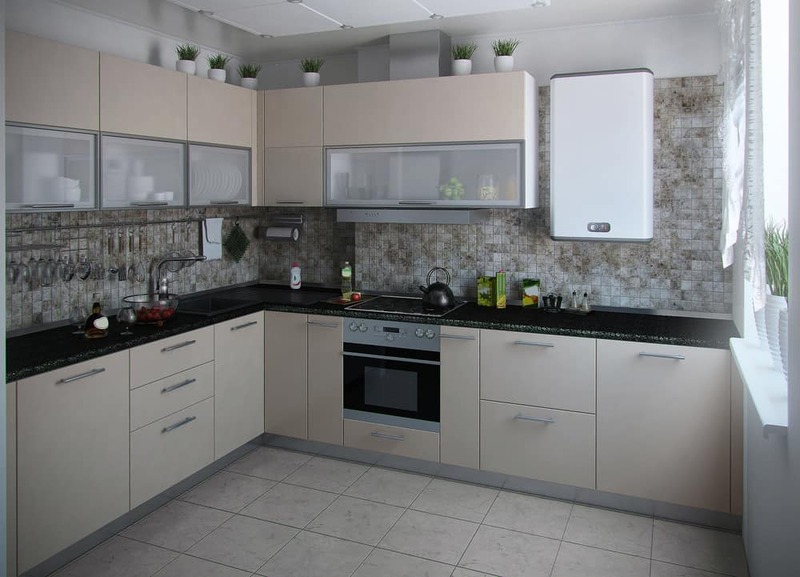 An L shaped kitchen design can be a great one because it provides you with plenty of space. These kitchens provide a great flow as well. Because they may not have anything behind you while you’re opening cabinets and cupboards, you have more comfort. There’s no need to try and move between cabinets. You have all the space of the rest of your kitchen available to move in. There’s also no reason to worry about the size you need to move around with larger dishes. The cost of your kitchen is going to depend on a number of different features. The specific cabinets and cupboards that you want are going to impact your cost. If you want high quality pieces you’ll pay more. Specific types of wood or custom designs and sizes will impact your cost as well. Even more, the size of your kitchen is going to impact how much you pay. 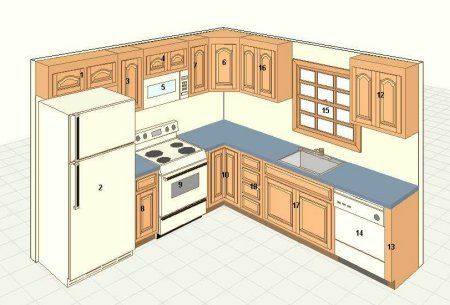 If you have a 10’ x 10’ L shaped kitchen layout versus a 15’ x 15’ L shaped kitchen design, you’re going to spend a different amount. 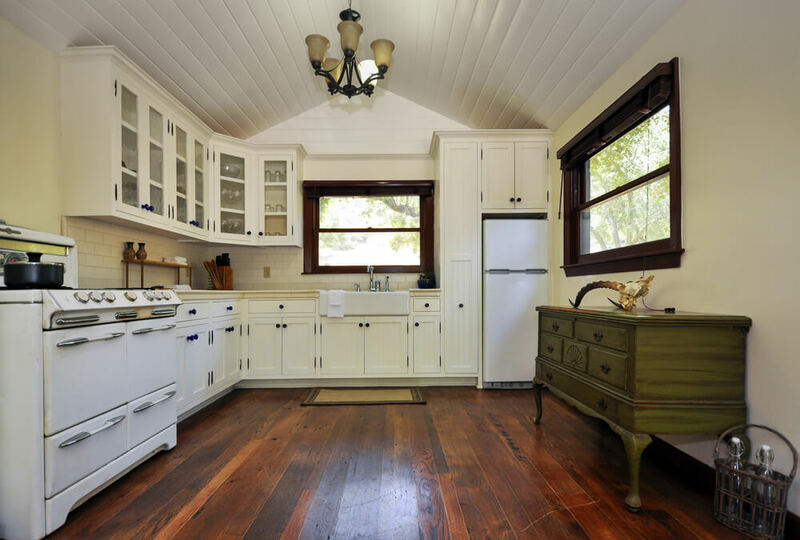 An average remodel of a kitchen will cost around $20,000, though you could easily spend more money. 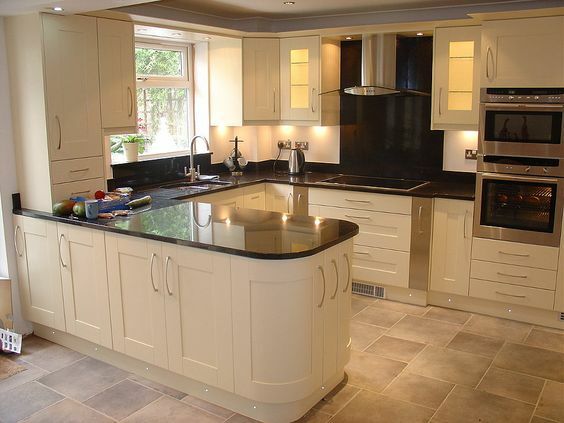 If you want to upgrade things or if your kitchen is larger than average you could be looking at more. If you want something basic or your kitchen is small you could be looking at a little bit lower cost. Also, you may need only a few cabinets or more minor remodeling. All of this will help you get what you need at the cost you want. If you’re not sure what you want when it comes to a new kitchen you want to look at some of these options. There are plenty of them to choose from and you’ll definitely find something you like. Of course, you should keep in mind that these options are adjustable too. You can always change out colors or slightly adjust styles as you want. There’s no reason not to give it all a chance. 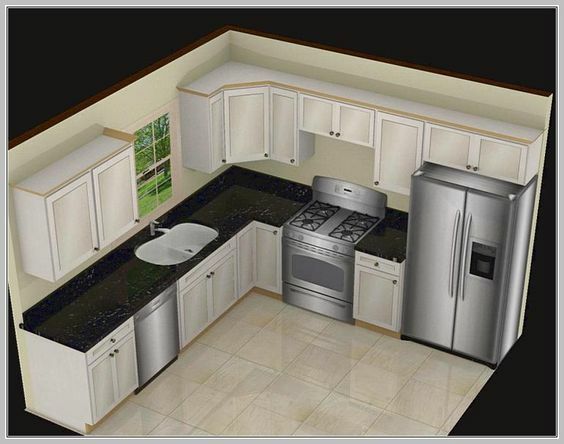 This L shaped kitchen layout is definitely stylish with white cabinets and black speckled countertops. It provides a classic layout that’s very functional and easy to use. This white setup has mostly cabinets on one side and appliances on the other. It also features an island to provide a little bit more counter space. 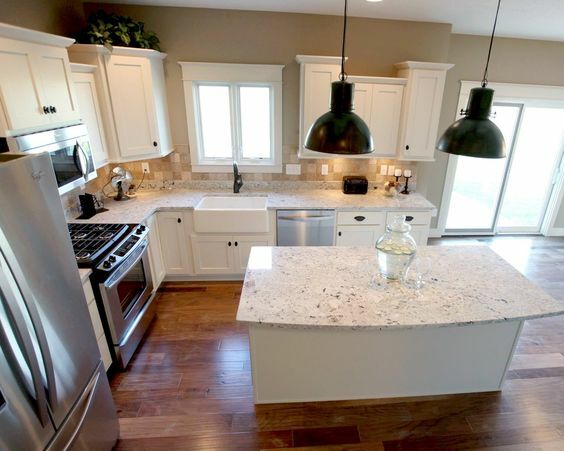 Here we’ve got a mix of white and blue cabinets as well as white and butcher’s block countertops. The L shaped kitchen layout also has an island and a wide door on the side to help get more space and more cabinets. The brown colors definitely provide a little bit darker surface and room. You still get a little bit of color and a little bit of dark wood stains at the same time. 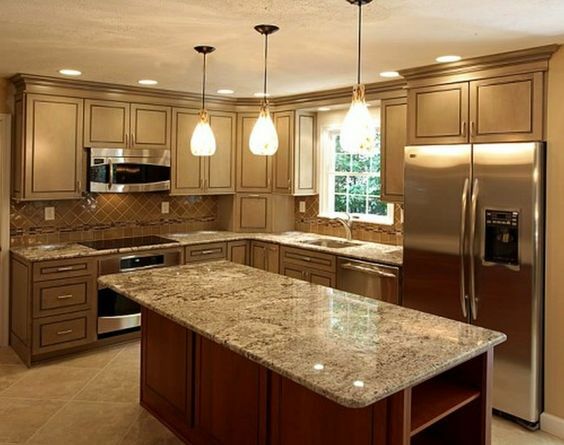 This layout features a lot of cabinets in a very light color of wood. It definitely creates a functional layout that will be easy to use and convenient for anyone. 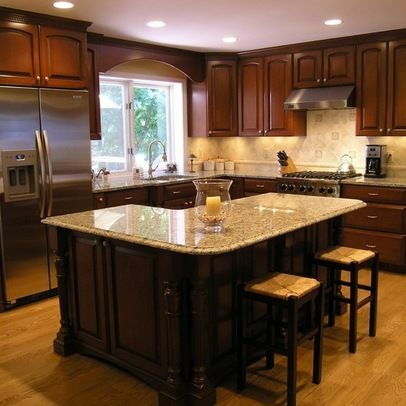 The dark cabinets here have an L shape but there’s also a large island in the middle to provide more surface. You will have no problem getting to everything you want and putting it all away. 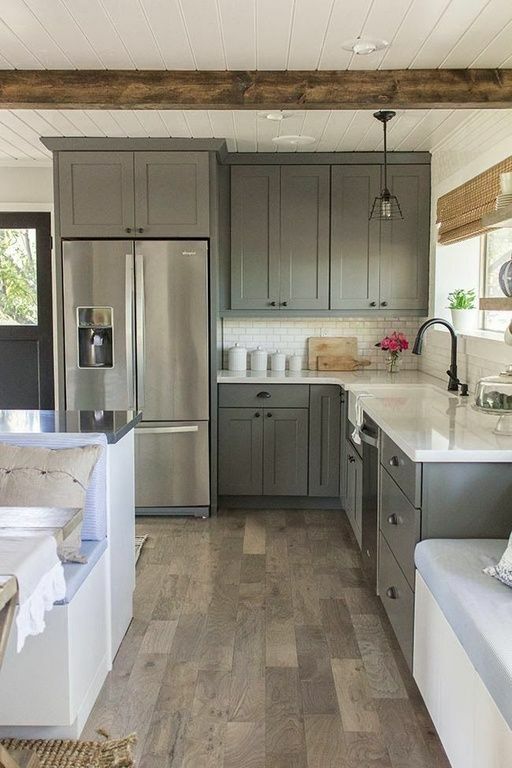 The gray cabinets here work well with the wood plank style of the floors. The L shape is offset here, with a shorter edge with the fridge and a longer one on the other side. 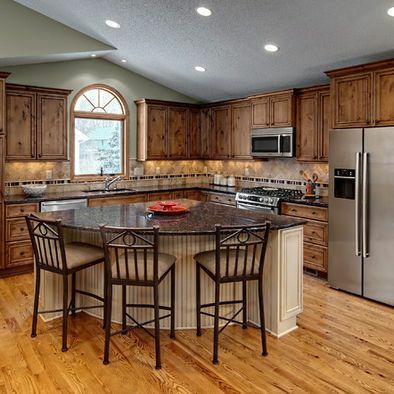 This is a nice looking cabinet style with a huge island that provides a whole lot of extra space. It also has plenty around the outside that will give you space and convenience. 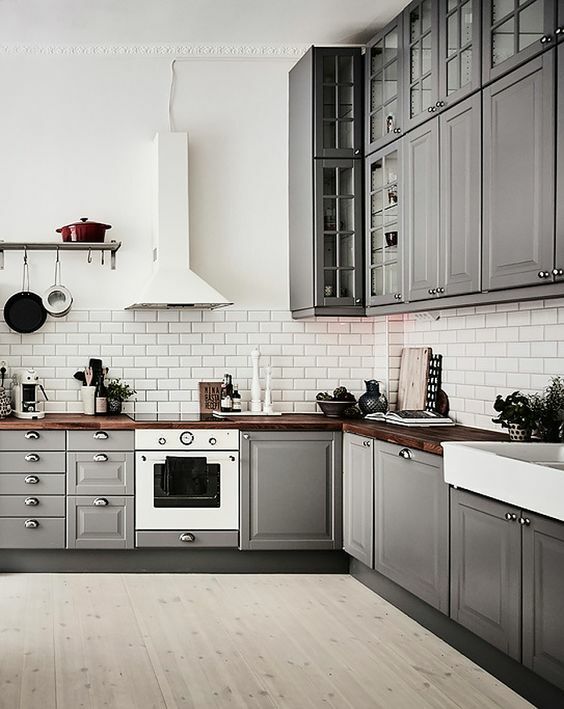 These gray cabinets are huge, so you get plenty above and below. You also get dark wood countertops to provide a great balance. It looks a little darker but a whole lot of fun. The cabinets here form an L shape but they also have an island sticking off the side to provide a little more space. You can also get plenty of cabinets because of the design. This rustic style is definitely unique and provides a great look. 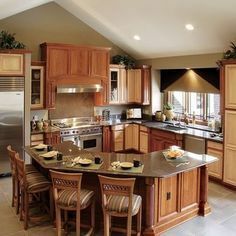 It’s a smaller kitchen, but it’s definitely nice and perfect for a cabin style kitchen with the large island. 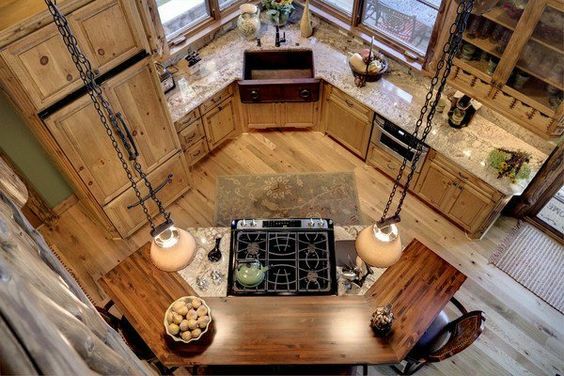 There’s a little bit of a rustic style to this L shaped kitchen layout and the center really helps to improve the rustic and cottage feel of the entire room. This is a modern kitchen and it’s definitely small, but it really works. 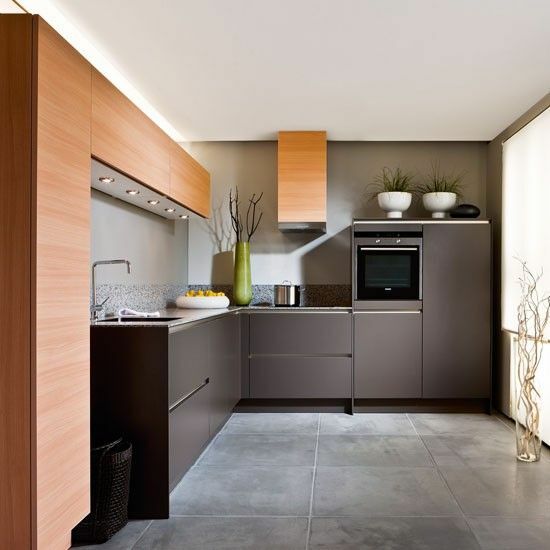 You get enough balance on the different appliances and the cabinets to fit with a minimalist style.